Keep your pond water consistently and efficiently moving using this Little Giant Premium Submersible Water Feature Pump. This rugged pump is manufactured for powerful, twenty-four hour operation with a streamlined design. 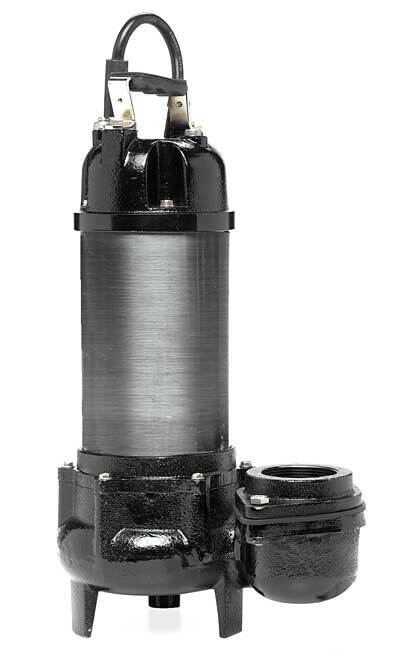 Featuring a sturdy, cast iron base and stainless steel housing, this submersible pump is ideal for use with large ponds or waterfalls. The hardy construction ensures a long operational life, and the unit can handle solids up to 0.75" diameter. The permanently sealed motor has a non-clogging vortex impeller and thermal overload protection, to prevent failure due to overheating, assisted by the stainless steel chassis. The Little Giant Premium Submersible Water Feature Pump will faithfully power your extra large water feature with proven durability and consistent performance. The sound and vision of a waterfall cascading down rocks into a pond or stream enhances a water garden in a way no other water feature can. This 2 horsepower pump offers reliable pressure, even at high head heights, and its outlet accepts 3" MIPT fittings for a generous water flow. Its automatic reset motor will cease functioning if the pump gets too warm, preventing permanent damage to the components. Capable of turning 16,000 gallons of water per hour at 5' of head height and handling solids, this Premium Submersible Water Feature Pump is ideal for the high demands of any large water feature. Two year limited warranty.